The U.S. Air Force's mysterious X-37B space plane is nearing a major milestone — one year of travel in Earth orbit, performing duties in support of long-term space objectives. The unmanned X-37B spacecraft — flying a mission known as Orbital Test Vehicle 3 (OTV-3) — launched into space atop an Atlas 5 rocket from Florida’s Cape Canaveral Air Force Station on Dec. 11, 2012. What payloads the space plane is toting and the overall mission goals on its confidential cruise are classified. This same vehicle was flown on the X-37B program's inaugural flight back in 2010. That OTV-1 mission lasted nearly 225 days in orbit, gliding back to Earth on autopilot over the Pacific Ocean and touching down at Vandenberg Air Force Base in California. An OTV-2 mission, which used a different X-37B space plane, was lofted in 2011. That vehicle flew for 469 days, more than doubling its sister ship’s space stay, concluding its mission by also making a Vandenberg landing. A global network of skywatchers has been keeping an eye on the robotic space plane's movements during its three flights to date. Some veteran observers, like skywatcher Kevin Fetter of Brockville, Ontario in Canada, have even captured video of the X-37B space plane in the night sky. "All three OTV missions maneuvered to change altitude at least once between launch and landing. Between maneuvers, they made frequent small thruster firings to counteract the effects of atmospheric drag, to maintain a nearly constant altitude," said Ted Molczan of Toronto, a leader in the worldwide community of satellite trackers. "OTV-3, as of day 343 in flight, has occupied two different orbital altitudes, accomplished using standard Hohmann transfer maneuvers about 11 weeks after launch," Molczan said in a Nov. 22 email. Graphic depicts mean altitude versus mission elapsed time for all three X-37B space plane missions. 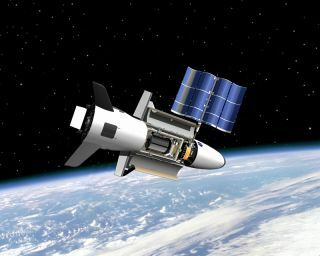 The two known X-37B space planes have been built for the Air Force by Boeing Government Space Systems, with flights conducted under the auspices of the Air Force’s Rapid Capabilities Office. The 11,000-pound (4,990 kilograms) X-37B is one-fourth the size of an orbiter in the now-retired NASA space shuttle fleet but relies upon the same type of lifting-body design. The vehicle is 29 feet (8.8 meters) long and nearly 15 feet (4.5 m) wide and has a payload bay that measures 7 feet (2.1 meters) long and 4 feet (1.2 meters) wide. Traveling in low-Earth orbit, the space plane operates from 110 miles (177 kilometers) to 500 miles (805 km) in altitude. According to a Boeing fact sheet, each space plane is built with lightweight composite structures, rather than traditional aluminum. A new generation of high-temperature leading-edge tiles for the wings is utilized, distinct from the space shuttle’s carbon leading-edge segments. The X-37B is outfitted with toughened uni-piece fibrous insulation impregnated silica tiles, which are significantly more durable than the first-generation tiles used by the space shuttle. Advanced conformal reusable insulation blankets are used for the first time on the X-37B. The Boeing fact sheet also points out that avionics on an X-37B are designed to automate all de-orbit and landing functions. Additionally, there are no hydraulics onboard the winged vehicle; flight controls and brakes use electromechanical actuation. Mission control for OTV flights are handled by the 3rd Space Experimentation Squadron at Schriever Air Force Base in Colorado. This unit is billed as the Air Force Space Command’s premier organization for space-based demonstrations, pathfinders and experiment testing, gathering information on objects high above Earth and carrying out other intelligence-gathering duties. While details are scant about the X-37B program, a little light on the project may be shed during the National Space Club'’s 57th Annual Robert H. Goddard Memorial Dinner, to be held next March in Washington, D.C.
Slated to receive the General Bernard Schriever Award at the event is Major Joshua Chumley, USAF, Commander, Operating Location Alpha, 3d Space Experimentation Squadron, U.S. Air Force Space Command. Chumley is on tap to pick up the prestigious award "for leading a selectively manned team responsible for operation of the United States’ first unmanned, autonomous, reusable space plane — the Orbital Test Vehicle, or X-37B," according to a National Space Club press release. Although there’s no official word how long the OTV-3 mission will go, there has been some talk that this craft may not land at California’s Vandenberg Air Force Base. The Air Force has been evaluating auto-piloting the vehicle down at the space shuttle landing strip at NASA's Kennedy Space Center, next door to its Cape Canaveral departure site. Making use of former space shuttle infrastructure is viewed as a possible cost-cutting measure for the program, officials have said.